Home › Radio › Audio Platforms Co-Existing? Overall, audio has gained traction in the U.S. as more and more ways of listening emerge and as audio listening is perhaps the platform most conducive to today’s propensity towards multi-tasking. 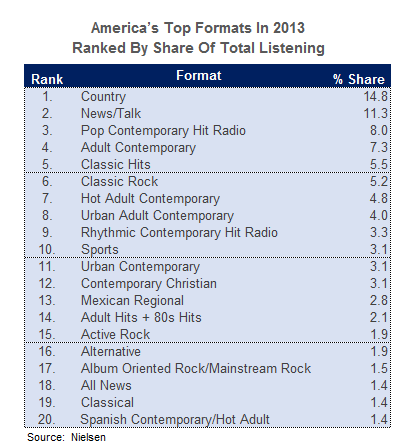 Among the choices, digital streaming seems to carry the most momentum, though traditional AM/FM still reaches far more Americans. Two major current studies are confirming how much audio listening has evolved, but also how some things never change. Despite the explosion of growth in broadband internet and mobile devices from 2003-2013, radio gained 20 million new listeners in that same time period. 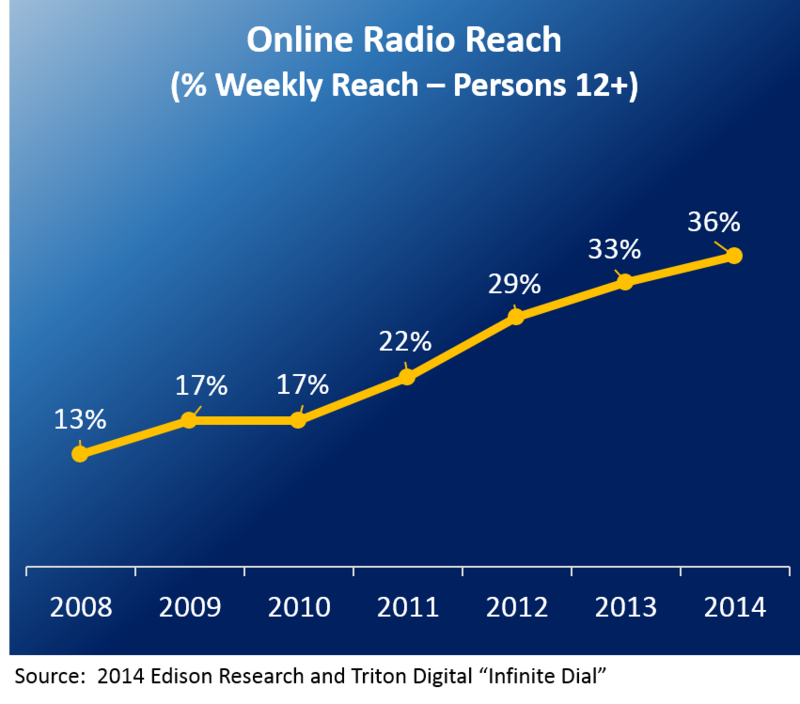 While one would expect internet radio services such as Pandora stealing share from traditional radio, most of their listeners have migrated from other sources. The percentage listening to CDs on a non-computer device and listening to digital music files on portable music players have seen significant decreases due to online radio. Nielsen recently released this past February “State of the Media: Audio Today 2014 – How America Listens.” In the report, 92% of everyone age 12 or older across America listens to radio each week. And the reach is nearly identical across all major demographic groups, ethnicities and geographies. Radio is also a hyper-local medium serving every unique community from one coast to the other. Overall, mid-day (10am-3pm) is the highest rated AM/FM daypart, while 7am is the highest rated hour during the weekday for radio listening. Consumers are listening for more than 2 ½ hours every day – not only news, sports and traffic during drivetime, but music is still a key reason for listening, including while they are at work. 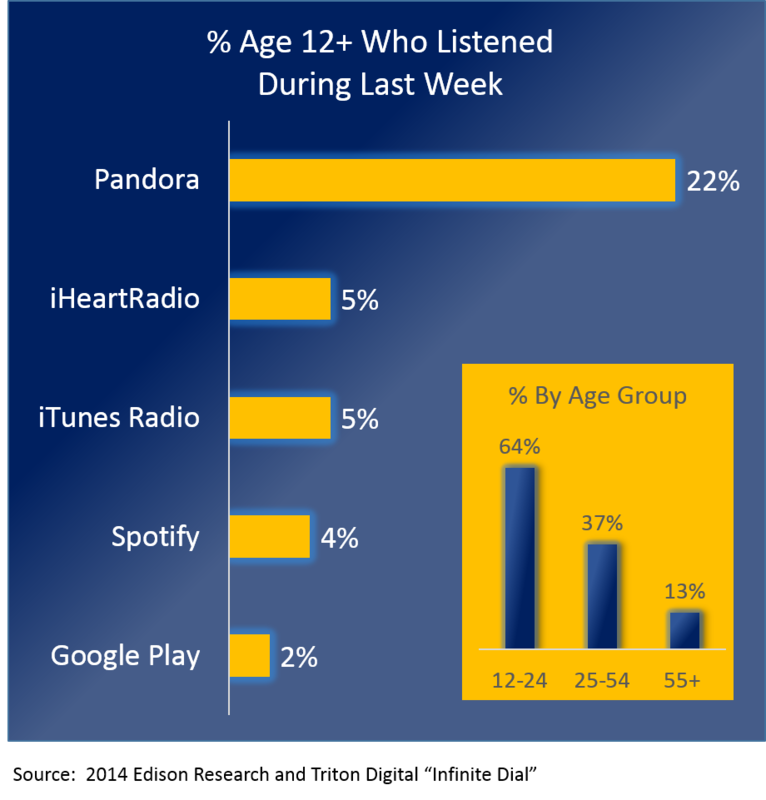 Per the second study also just released, some 36% of Americans age 12 and up listen to online radio on a weekly basis, up from 33% last year and 29% a year earlier. According to the latest annual “Infinite Dial” report from Edison Research and Triton Digital, alongside rising reach comes increased time spent with the medium: on average, weekly online radio listeners report spending 13 hours and 19 minutes per week listening, up from slightly less than 12 hours per week in last year’s study. The internet radio medium skews young, with an estimated 64% or more of listeners falling within the 12-24 year old group. In the same study, 75% of consumers say AM/FM radio is their top source overall for keeping up-to-date with music, and in-car usage of AM/FM radio is the highest at 58% versus other sources. In addition, AM/FM radio streams are an important part of online radio usage. In summary, unlike early fears of digital displacement, online radio really hasn’t proved to be a significant competitor to AM/FM radio, yet. Consumers have made more time for using online radio (at the expense of CDs in particular), and online and AM/FM radio certainly are both valued audio resources.